Happy Wednesday! I have been on a more relaxed schedule with summer activities taking some of my time away from crafting. We are will have family visiting in another week and there is a lot to do to get ready. We will get to meet our great niece who was born last September for the first time (she lives in Switzerland). Welcome to lots of new subscribers in the last few days. I think most of you found me through the Cricut Explore email that went out on Sunday. I hope that you will find lots of help and inspiration here. There have been more emails and other messages than usual but I am nearly caught up. If you sent me a message and haven't had an answer by the end of today, please send it again - things do sometimes go missing. 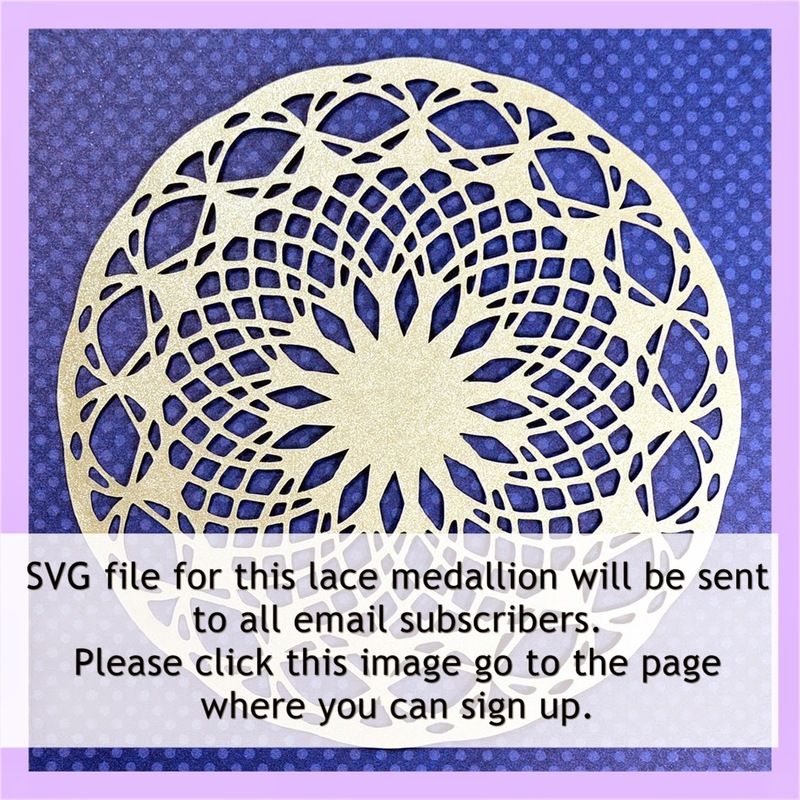 A few people have asked how to use the lace medallion that is a free gift for subscribers. You can use this file on any machine that will cut SVG files. Cricut users will need to have the Explore machine to cut this file. In the blog post HERE I give instructions on how to upload an SVG file to use it in Design Space - if you still have questions, just leave a comment for me. Today is "One Buck Wednesday" at Snap Click Supply (the new home of Jessica Sprague digital supplies). This adorable school mega collection by Samantha Walker is just $1 - the normal price would be $26.99. Click HERE to go to the sale (I am not an affiliate, just a long time customer). You will find this set in the middle of the right column - there are lots of nice things on sale this week. Remember, this sale only lasts for one day - today! Next week there will be new items in the sale. I use my One Buck Wednesday purchases with my Artisan software (formerly Creative Memories Storybook Creator). You can import the jpeg and png files for the papers and embellishments into a personal art kit. If you have questions about the software or how to import other digital kits to use in the program just let me know. I might do a blog post to help you sort things out - be sure to leave specific questions if you can't find the answer in the software help. If you don't have Artisan, I highly recommend it. The program is easy to use and you can do a lot of interesting things with it. I use it for all of my digital scrapping and also for making cards, invitations and other paper projects. 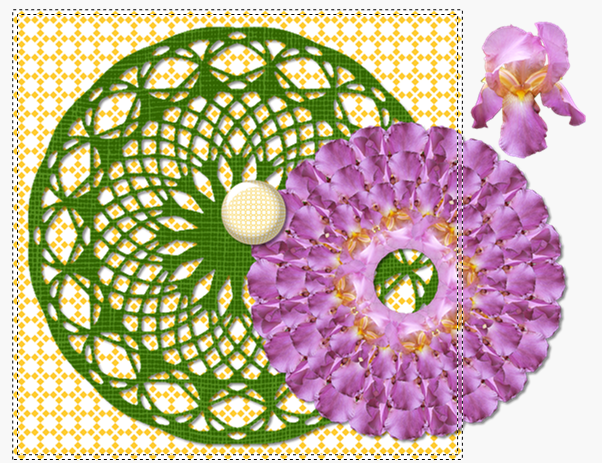 If you look carefully, you can see that I turned my lace doily design (the subscriber gift file) into a digital image to use for more projects. 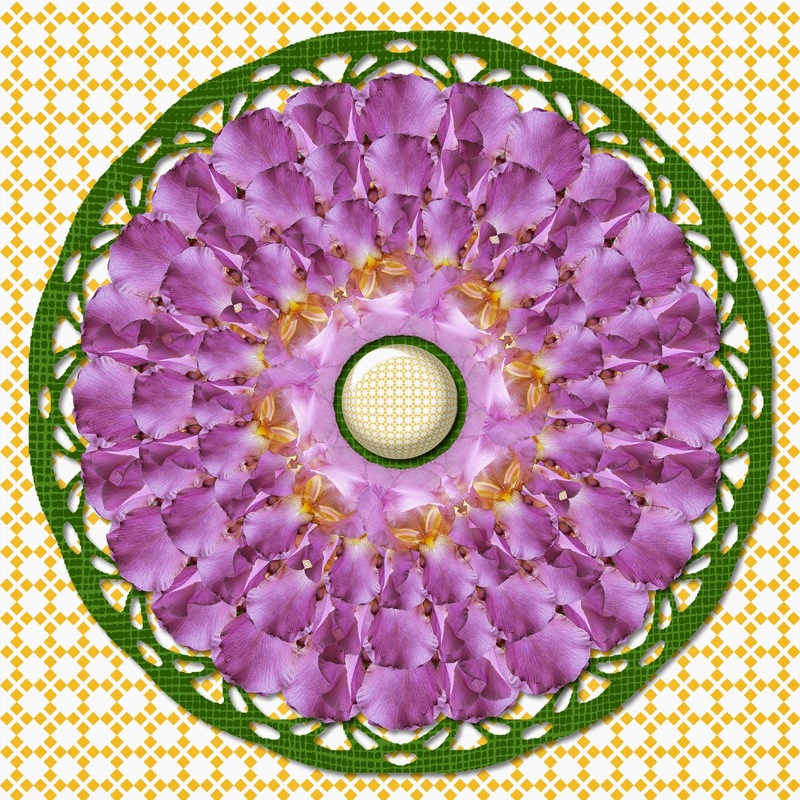 I also used one of my photos of an iris and created a large layered medallion. The background paper and the center ball are all things that I created using the Artisan program. (I was a Creative Memories consultant and I am now an affiliate for Panstoria - the company that developed the program). Over the weekend, we started moving furniture around. We took a loveseat to my husband's parents to use in their downstairs TV room. We also turned our pool table 90 degrees and this created much more space (it is in one of the rooms where I craft). Well one thing led to another and I have completely torn up my craft space and I am putting it back together with a lot of changes in the arrangement of the furniture. It's hard work to move everything but I am excited to see the end results. Maybe I'll finally do that craft room video people keep asking for!). Will you be offering the free SVG to us that don't have an Explore but are able to cut SVG's? Thank you! Hi Sue, The file is free for everyone who subscribes. I worded that poorly. I just meant that if you are a Cricut user you would need the Explore because the earlier machines don't accept SVG files. Are you a new subscriber? You should have received a welcome email that included the link to download the file. If you have been a subscriber for a while you should have received an email on the 9th of June with the link. If you didn't get the email, please let me know - I'll need the email address you used to subscribe and then I can resend the file link message.